USA market has been very strict on foreign steel products. Before this project,the client received different offers from USA and European mills.The quality is good,but price is too high compared with the limited budget. Then they approached Grand Piling for a solution. After technical evaluation and takes with project designer and engineers,the clients finally placed the order to Grand Piling.Calculations were carried out by Grand Piling in order to ensure that the stringent requirements of the Client and the Contractor were met whilst at the same time the budget constraints needed to be adhered to. 1200 tons of IIIW and 750 tons of IVW type hot rolled sheet piles are used in this project. 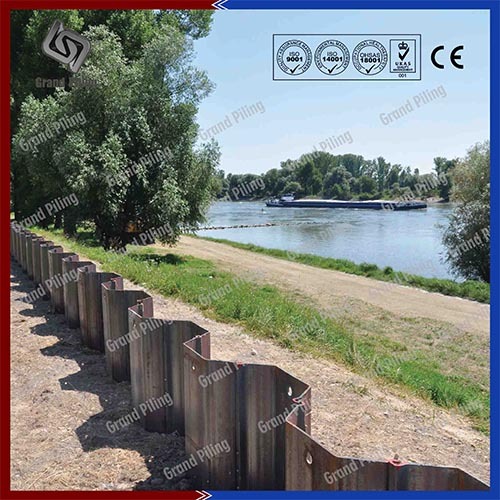 Extra clutches were sent along with the shipment to ensure that if any special corners were needed to be turned or obstacles caused a variation in the driving line.The sheet piles with their wide profile made an ideal selection due to their very limited clutches per metre of wall. The sealing of the clutch is at least half that of other sheet piles and this also means less risk of seepage for the Contractor.